In accessible language, James Scott, recognized worldwide as an eminent authority in Southeast Asian, peasant, and agrarian studies, tells the story of the peoples of Zomia and their unlikely odyssey in search of self-determination. He redefines our views on Asian politics, history, demographics, and even our fundamental ideas about what constitutes civilization, and challenges us with a radically different approach to history that presents events from the perspective of stateless peoples and redefines state-making as a form of “internal colonialism.” This new perspective requires a radical reevaluation of the civilizational narratives of the lowland states. Scott’s work on Zomia represents a new way to think of area studies that will be applicable to other runaway, fugitive, and marooned communities, be they Gypsies, Cossacks, tribes fleeing slave raiders, Marsh Arabs, or San-Bushmen. The author of several books including Seeing Like a State: How Certain Schemes to Improve the Human Condition Have Failed, James C. Scott is Sterling Professor of Political Science, professor of anthropology, and codirector of the Agrarian Studies Program, Yale University, and a fellow of the American Academy of Arts and Sciences. Tim Brown, CEO of IDEO, shows how the techniques and strategies of design belong at every level of business. Design thinking is not just applicable to so-called creative industries or people who work in the design field. It’s an approach that has been used by organizations such as Kaiser Permanente to increase the quality of patient care by re-examining the ways that their nurses manage shift change or Kraft to rethink supply chain management. This book is for creative business leaders who seek to infuse design thinking into every level of an organization, product, or service to drive new alternatives for business and society. 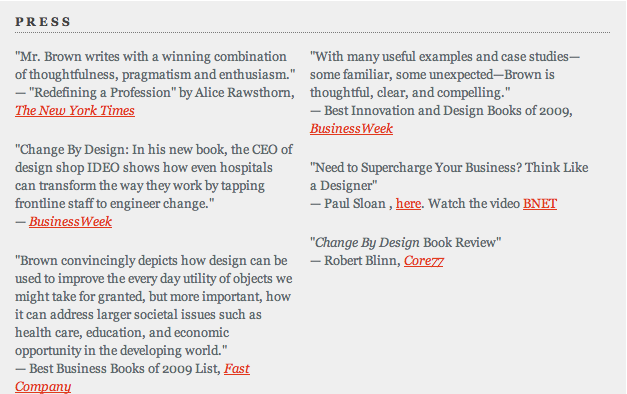 Listen to Tim’s interview with Brian Lehrer on design thinking and Change By Design here. Out of Poverty teaches us to think simple. Paul Polak brings forward ideas and solutions that bypass government agencies and other leaden institutions. Ideas that work! In this impassioned and iconoclastic book, entrepreneur, inventor and self-identified “troublemaker” Paul Polak tells why mainstream poverty eradication programs have fallen so sadly short and how he and his organization developed an alternative approach that has already succeeded in lifting 17 million people out of poverty. (Watch video of Paul on his 12 steps to Practical Problem Solving). Drawing on his 25 years of experience, Polak explodes what he calls the “Three Great Poverty Eradication Myths”: that donations alone will end poverty, that national economic growth will end poverty, and that big business, operating as it does now, will end poverty. Polak shows that programs based on these ideas have utterly failed–in fact, in some areas where these approaches have been tried, such as sub-Saharan Africa, poverty rates have actually gone up. Throughout Out of Poverty Polak tells fascinating and moving stories about the people he and IDE have helped, especially Krishna Bahadur Thapa, a Nepali farmer who went from barely surviving to earning $4,800 a year; solidly upper middle class by local standards. Out of Poverty offers a new and promising way to end world poverty, one that honors the entrepreneurial spirit of the poor themselves. My fifteen-month-old grandson, Ethan, has fallen in love with a neighbor’s driveway. It sits two houses down from where he lives, and it seems to overflow with small, multicolored stones. He stops there when I take him for a walk, and then he refuses to leave. He picks up a handful of stones and inspects each one carefully. He places them one after another in my hand, watching intently, and I give them back to him one by one until his hand is full again. I don’t know who has given him the job of turning every little stone over and over in his hand until he understands its very essence, but that’s the job he has accepted, and he’s not leaving until it’s done. I think I must have inherited a lot of genes from Ethan, because I operate just like he does. I live to play and to satisfy my curiosity. For the past twenty-five years, two questions have kept my curiosity aroused: What makes poor people poor? And what can they do about their poverty? Because of these infernal questions, I’ve had thousands of conversations with one-acre farmers with dirt on their hands, and they have offered me more cups of steaming tea than my seventy-three-year-old kidneys can take. I have learned more talking with these poor farmers than from any other thing I have done in my life. Out of Poverty tells their stories, describe some of the things they have taught me, and shows how what I learned has been put to work in straightforward strategies that millions of other poor people have used to end their poverty forever. Each of the practical solutions to poverty I describe is obvious and direct. For example, since 800 million of the people whose families survive on less than a dollar a day earn their living from small farms, why not start by looking for ways they can make more money from farming? And since these farmers work for less than a dollar a day, why not look for ways they can take advantage of their remarkably low labor rates by growing high-value, labor-intensive cash crops and selling them at the time of year when these crops will fetch the highest prices? I hate books about poverty that make you feel guilty, as well as dry, academic ones that put you to sleep. Working to alleviate poverty is a lively, exciting field capable of generating new hope and inspiration, not feelings of gloom and doom. Learning the truth about poverty generates disruptive innovations capable of enriching the lives of rich people even more than those of poor people. My hope is that you will read Out of Poverty and come away energized and inspired. There is much to be done. 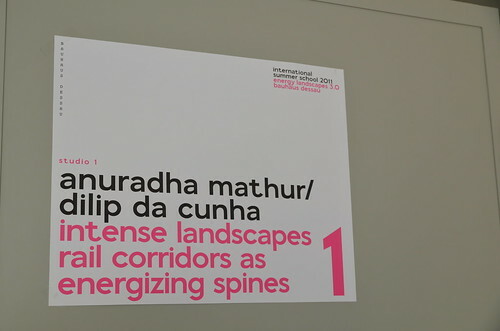 I’m currently at the Bauhaus in Dessau Germany – part of workshop lead by Anurhada Mathur & Dilip da Cunha entitled Intense Landscapes: Rail Corridors as Energizing Spines (in India). 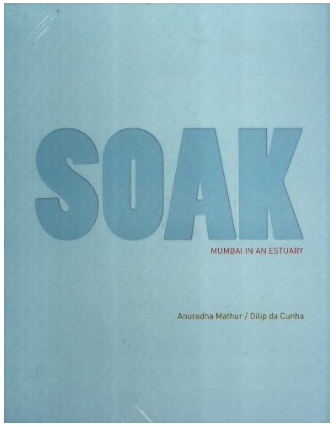 Anurhada Mathur & Dilip da Cunha also developed an exhibition/book called SOAK: Mumbai in an Estuary. Here is the SOAK website. An the description of the project. There are certainly similarities between Mumbai and Phnom Penh. Until recently Mumbai was accustomed to being soaked by the monsoon. The rains of July 26, 2005, however did not soak the city; they flooded it. Hundreds died and much property was lost as parts of Mumbai went under many feet of water. Those rains were unusual. The average for the whole season fell in a day – 944 mm. . . .However, it takes much less to flood Mumbai today. Three years on, 100 mm of rain or less is enough to cause a ‘flood’ and suggest that Mumbai is shifting from welcoming or abhorring a soak by the monsoon to fearing and fighting being flooded by it. Soak to flood is a profound shift. It makes an enemy of a friend even if it is a friend who is not always welcome. . . . Awaiting the monsoon for better or worse is increasingly being replaced by a readying for battle. The build up to war has occurred on many fronts. . . . But it has occurred more pertinently, from our point of view, through the cultivation of an attitude to terrain grounded in the belief that land and water are separable. This attitude has encouraged a landscape of hard edges and clear and distinct entities, and fostered a spirit predisposed to privileging land over water, firmly held property lines over open terrains, defined land uses over fluid occupancies. It takes a considerable effort to enforce firmness anywhere, but it is particularly difficult to do so in an estuary, the primary ecology of Mumbai. Unlike deltas where rivers reach into the sea, estuaries allow the sea in. As such the rise and fall of the sea is not restricted to a coastline but is carried inland on a gradient that takes with it not just predictable tidal levels but the complexities of the world’s oceans where the unexpected reaches beyond the horizon and often beyond control. Here the war against the monsoon is also a war against the sea. . . . If the monsoon has been cultivated as a seasonal opponent, the sea has been made a perennial one. Sea walls, landfills, causeways, tetrapods, knowledge and prediction have been used to keep the sea out. . . . The 2005 flood, however, stilled Mumbai long enough to take notice of the sea within land’s edge. It is an occurrence that can be expected to occur more often with the predicted rise in sea levels. Whether as river or sewer the Mithi is singled out by engineers and the public as a primary cause of the 2005 flood because it failed to fulfill the dual role of a drain on the West Coast, namely, carrying monsoon waters out and accommodating the high tide of the Arabian Sea. Today, engineers are working to ‘master plan’ the Mithi, ‘training’ it with walls to conform as much to two lines on a map as to a channel on the ground, although it is intended that this channel be ‘landscaped’ to also satisfy a ‘recreational’ need. It is an end-scenario that is questionable not only for its continued refusal to engage the landscapes of an estuary; it is also questionable by its own measures. The planned channel is far too small to carry the waters of another 944 mm rainfall which is deemed by engineers an event that is too expensive and improbable to accommodate both politically and financially given the size of the channel that it demands and the extent of settlement that it will displace. Soak, in brief, is about making peace with the sea; about designing with the monsoon in an estuary. Osborne, Milton. The Mekong: Turbulent Past, Uncertain Future. Atlantic Monthly Press, 2000. Tully, John. France of the Mekong: A History of the Protectorate in Cambodia, 1863-1953. Tully, John. 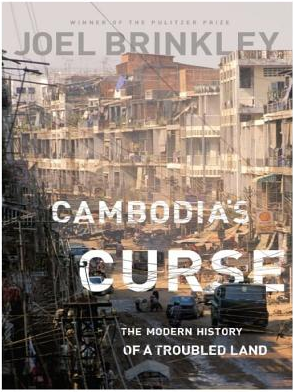 A Short History of Cambodia: From Empire to Survival. Lewis, Norman. A Dragon Apparent, Travels in Cambodia, Laos and Vietnam. Shawcross, William. Sideshow: Nixon, Kissinger and the Destruction of Cambodia. In the preface to “Cambodia’s Curse: The Modern History of a Troubled Land,” Joel Brink­ley recalls his first encounter with Cambodia. Brinkley was reporting for The Louisville Courier-Journal from a refugee camp near the Thai border in 1979, in the aftermath of Pol Pot’s reign. “As they tell of years of horror and misery,” Brinkley wrote, “their faces are expressionless and dull . . . as if they’re talking about a dull day of work. Their tales end with a nodding acknowledgment of the death of their nation and culture.” Brinkley, who later worked for The New York Times, finds little has changed in the 32 years since then. As the title suggests, his book is an unabashed plea to refocus international aid and diplomacy on a suffering people. It is also an attempt to hold some of those responsible for that suffering accountable — but not all.Cambodia lost a quarter of its population under the Khmer Rouge. For many, survival meant 14-hour days of backbreaking work, often on little more than a cupful of rice or a smattering of gruel. You could be killed on the least suspicion you sympathized with the Vietnamese. The effects of this period have proven hard to shake. Statistics of suffering aside, “Cambodia’s Curse,” when it is at its most thorough, acknowledges the role of rich countries in this disaster. Every year for more than a decade, Brinkley recounts, donor organizations and states made toothless pleas that Hun Sen pass an anticorruption law. But once money was pledged, the law would stall another year. As a result of this annual pas de deux, donors had given Hun Sen $18 billion by 2010, essentially with no strings, before the law was enacted. And when it finally did pass last year, it had been gutted into meaninglessness. Brinkley seems to dismiss the argument that the extensive bombing, with its tens, maybe hundreds of thousands of civilian deaths, might have added urgency to Sihanouk’s plea to join the Khmer Rouge. Yet Owen and Kiernan report that former C.I.A. and Khmer Rouge officers affirmed the American bombing helped the Khmer Rouge win support.It seems clear that “Cambodia’s Curse,” apart from providing a portrait of a “troubled land,” holds implications for other American interventions that are worth serious debate. Brinkley portrays Cambodia from what some may see as a postpartisan humanitarian standpoint. But given Washington’s role today in Iraq, Afghanistan and Pakistan, it might have been braver if he had chosen to hold Americans, and not just Cambodians, accountable for the suffering he so movingly describes. Three years, eight months and twenty days or the length of time that the Khmer Rouge occupied Phnom Penh. 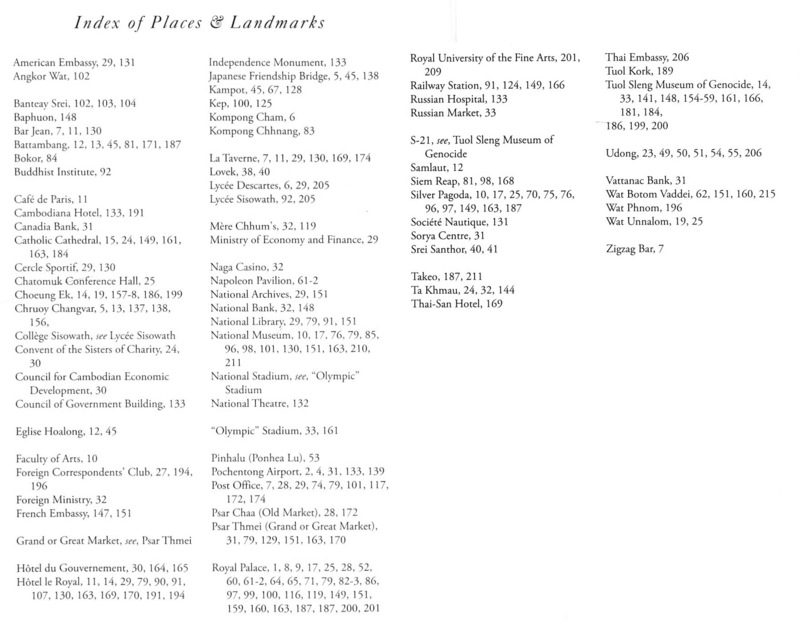 This week I began combing the Harvard Library system for all the research I can find on Phnom Penh before I no longer have access. 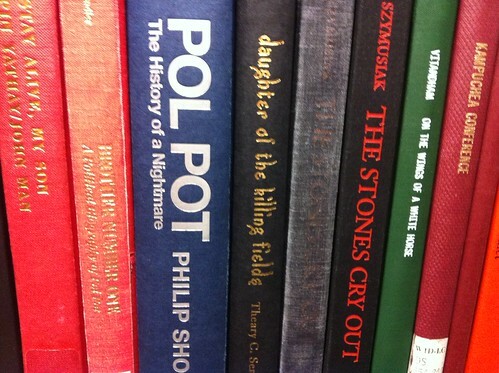 There is surprisingly little given the size of Harvard’s collection. 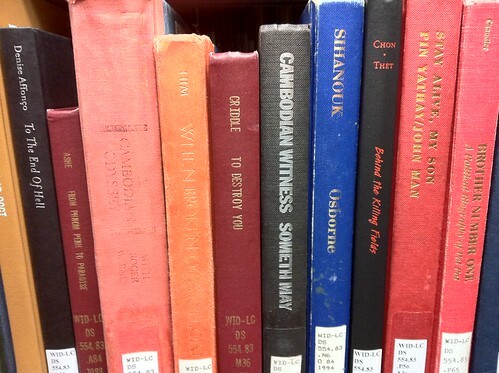 The majority of books in Widener are on the horrors of the Khmer Rouge. 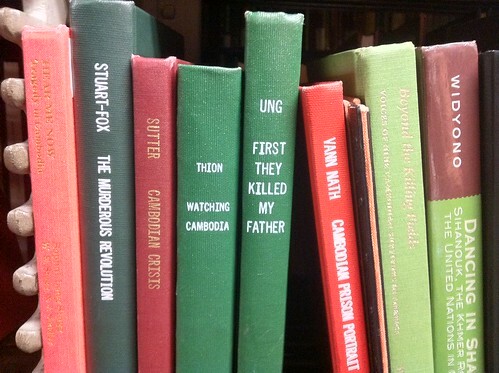 The titles are striking, among them: First They Killed My Father, The Killing Fields, and Pol Pot The History of a Nightmare. There is no doubt that the years between 1975 and 1979 were the defining moments of contemporary Cambodian history – however, this time period also comprises the majority of writing available on Phnom Penh – which is treated as little more than a drop back for the devastation of Pol Pot and his revolutionaries. After the Khmer Rouge had emptied the city in 1975, Phnom Penh had remained the country’s capital, but it never regained its status as an urban center. The bureaucrats, soldiers, and factory workers quartered there probably never numbered more than fifty thousand. During the DK era, the country had no stores, markets, schools, temples, or public facilities, except for a warehouse in the capital serving the diplomatic community. In Phnom Penh, barbed-wire fences enclosed factories, workshops, barracks, and government offices. Street signs were painted over, and barbed-wire entanglements blocked many streets to traffic. Banana trees were planted in vacant lots. Automobiles abandoned in 1975 were rusted in piles along with refrigerators, washing machines, television sets, and typewriters. Scraps of paper in the gutters included prerevolutionary currency, worthless under the Khmer Rouge. On 7 January 1979, no people or animals could be seen. As in 1975, the central government, such as it was, had disappeared. Once again, Cambodians were being made to start at zero. Despite this codified hatred of the city, few landmarks or buildings were destroyed in totality. Most notably, the Catholic cathedral and the National Bank. Other symbols of urban modernity were destroyed: car, shops, medical and university buildings. The roads from the airport were maintained and facades of the empty buildings painted to give the few chaperoned visitors a sense that the city was still in working shape. ”They took Cambodia from a country in the process of development to a communal society without the slightest vestige of the modern or the urban,” Van Molyvann, Cambodia Architect. On January 7, 1979 the Vietnamese liberated the city from the Khmer Rouge and began their occupation of Cambodia and its capital.